Art and design students have been imagining what Leonardo da Vinci would have been working on, had he been alive today. 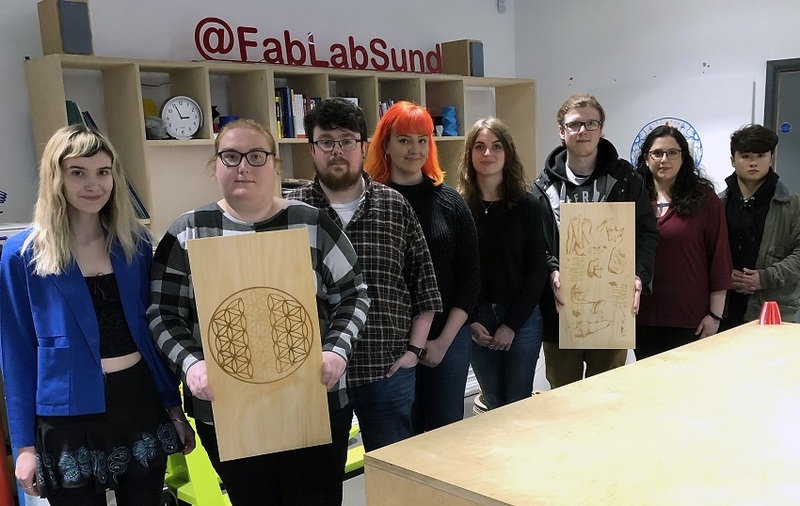 Based at the University's FabLab in Hope Street Xchange on City Campus, the project is part of a wider programme organised to complement the much-anticipated Leonardo da Vinci: A Life in Drawing exhibition which opened at Sunderland Museum & Winter Gardens on 1 February. The exhibition features 12 drawings from the Italian master and is part of a national tour to mark the 500th anniversary of his death. Sunderland is one of 12 UK venues chosen by the Royal Collection Trust to simultaneously host the exhibition, which will feature a total of 144 of Leonardo drawings. Niyla Claire Javaid, also studying an MA Design, added: “A group of us have worked on this project outside of our degree work. We’ve no doubt that Leonardo would be looking at the major challenges facing the planet and its inhabitants – so he’d be looking at solutions to issues such as global warming. The project was funded by the Silver Fund, created to give students studying at the University of Sunderland unique opportunities they would not otherwise have the chance to enjoy. The fund has supported dozens of students’ creative ideas – from installing equipment that allowed media students to set up their own DJ Society, to taking glass making out to the public on Roker Beach, to creating a hiking club; created for students who are not interested in traditional sport but want to stay fit. The ethos behind the FabLab is that anyone can make, just about, anything. Using the FabLab’s facilities, including a 3-D printer and a laser cutting machine, some of the group produced artwork on to layers of acrylic which appears to animate their artwork when lit. Students have been working in groups or as individuals on the Leonardo projects. Most were inspired by Leonardo’s anatomical drawings, several of which will feature in the Sunderland exhibition, and another by the mirror-writing that he used to describe his drawings and inventions. Another student project used a Leonardo’s drawing of a face side-on to help create a 3-D version of the woman’s head, again using FabLab’s technology. Jo Cunningham, Exhibitions, Collections and Archive Manager at Sunderland Museum & Winter Gardens, explained:“We’re using the exhibition's drawings as a catalyst to inspire and educate through a programme of projects and activities for people of all ages – the University’s FabLab project is a great example of how Leonardo can continue to inspire people. “We thought it would be really interesting to see how students would respond to the question ‘if Leonardo was alive now, what would he create?’"
The students’ finished work will go on display in the World Art case at the Museum during the exhibition’s run. A spokesperson for the University of Sunderland said: “This is unique opportunity for our talented Art and Design students to be involved in one of the most highly anticipated exhibitions to ever come to Sunderland. Following the exhibitions at the 12 venues, the drawings will be brought together to form part of an exhibition at The Queen's Gallery, Buckingham Palace, the largest exhibition of Leonardo's work in more than 65 years. A selection of 80 drawings will then travel to The Queen's Gallery, Palace of Holyroodhouse in November. Tickets for Leonardo da Vinci: A Life in Drawing, costing £2.50, can be pre-booked online or purchased at Sunderland Museum & Winter Gardens. Entry for under-16s is free, but they will need a ticket.